Who doesn’t love a good grilled cheese? I know I do. 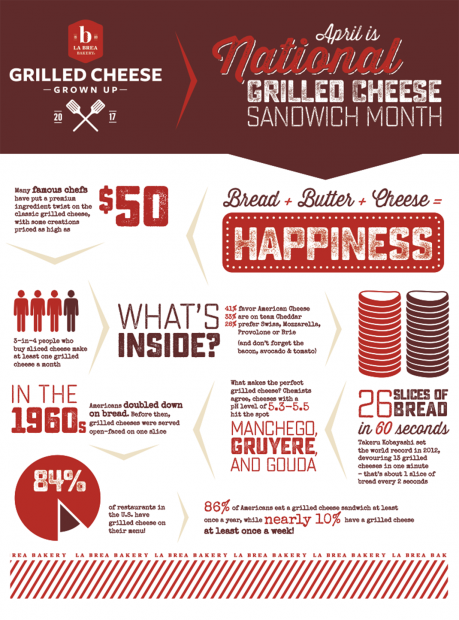 The month of April also happens to be Grilled Cheese Month so if there ever were a whole month to eat grilled cheese guilt free this is it. 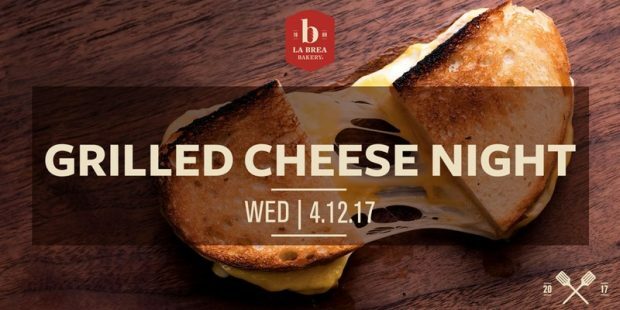 Legendary bread institution La Brea Bakery is hosting a nostalgic throwback Grilled Cheese Night celebration Wednesday, April 12 from 7pm to 10pm. Live music, champagne and wine pairings, a red carpet entrance, and many, many, many grilled cheese sandwiches will be served. Tickets are $35. 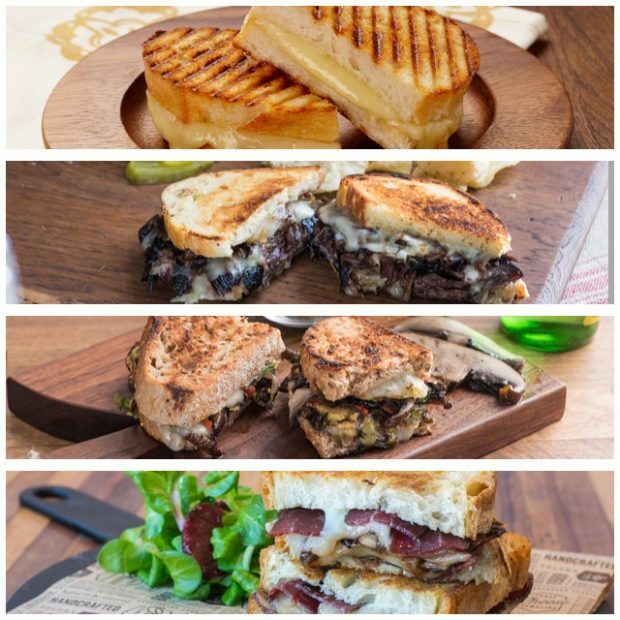 But if you’re simply looking for some fantastic grilled cheese recipes to make at home, La Brea Bakery has provided some unique and delectable recipes included here. Enjoy! It’s a grilled cheese festival if there ever was one! La Brea Bakery will also be showcasing wines and champagnes from Navarro Winery, Opolo Vineyards, Tablas Creek Vineyards, and, of course, Moet Chandon. There will also be a professional Cheese Stretcher from DiStefano Cheese pulling fresh Mozzarella cheese. Yum! Plus a live DJ and giveaways of wine, cheese, and La Brea Bakery Breads will be there to complete the night. Get your tickets here and hope to see you there! And be sure to check out these delicious grilled cheese recipes below. Happy eating! Your childhood favorite to a whole new level. Enjoy! Place a medium cast iron skillet or similar over medium-low heat and preheat the pan for 2 minutes while you assemble the sandwich. Butter each slice of bread on one side and lay the bread out on your cutting board butter side down. Place two slices of both cheeses on each piece of bread and top with the remaining bread slice. Carefully transfer the sandwiches to the preheated pan and cook over medium-low heat for 3 minutes per side or until bread is golden brown and cheese has melted. Saute the onions in 1 oz. of the clarified butter over medium heat. Add the balsamic vinegar and reduce heat to low. Cook until balsamic is reduced and onions are reduced down. To assemble sandwich: Place cheese on both slices of the bread. Place 1/4 of onions on top of cheese along with 2 oz. of sliced bresaola. Brush outside of sandwich with clarified butter. Saute in nonstick pan on both sides until bread takes on golden color. Place in 375 degree oven to melt cheese if it has not melted. Wow – this grilled cheese recipe is on another planet good! 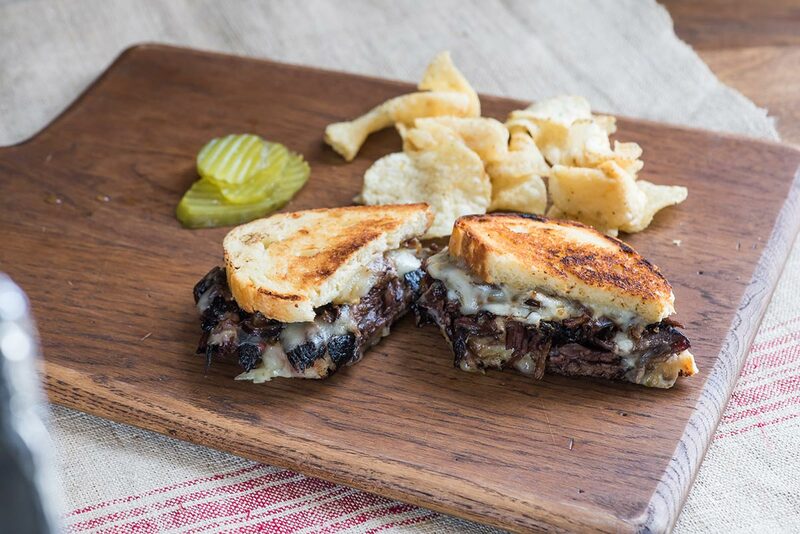 Place two slices of Jack on each piece of bread add the short rib and onion jam and top with the remaining bread slice. 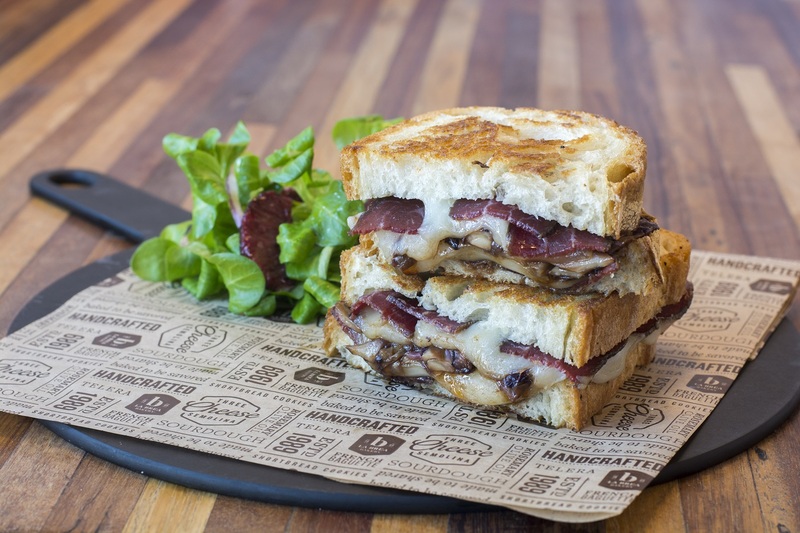 You won’t miss this meat on this ooey gooey and delicious grilled cheese sandwich. One of our favorite grilled cheese recipes. Place a medium cast iron skillet or similar over medium low heat and preheat the pan for 2 minutes while you assemble the sandwich. 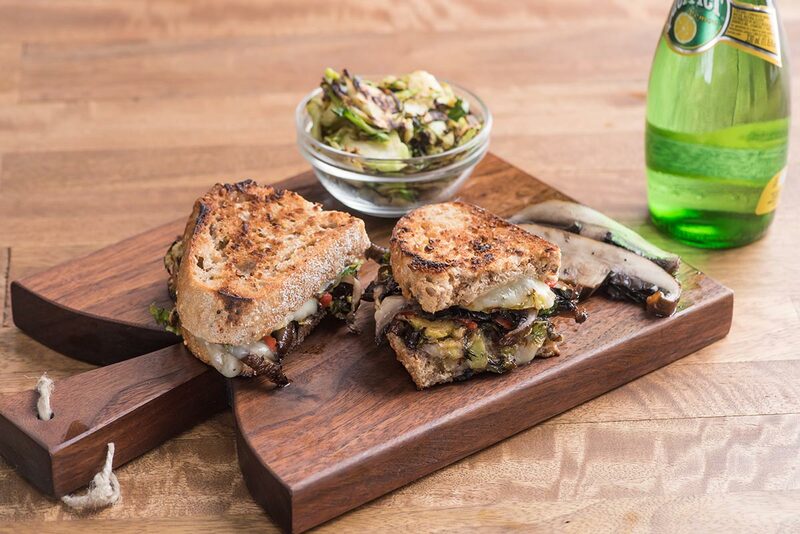 Place two slices of Fontina on each piece of bread, add Portabella mushroom, roasted red pepper and shaved Brussels sprouts. Spread Thyme Aioli on second slice of bread and top to complete the sandwich. Carefully transfer the sandwiches to the preheated pan and cook over medium low heat for 3 minutes per side or until bread is golden brown and cheese has melted. 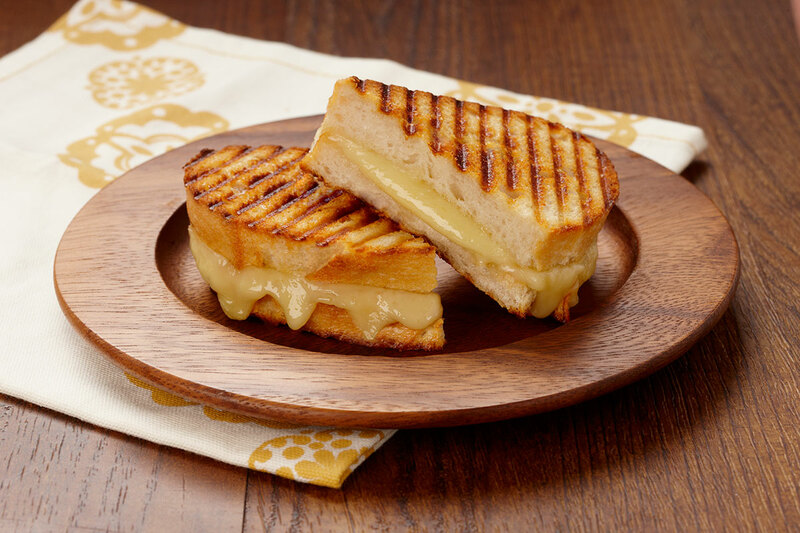 All grilled cheese recipes and photos courtesy of La Brea Bakery. What are your favorite grilled cheese recipes? A new favorite of ours is to use a Homemade French bread recipe courtesy of Jens Reviews. It’s deceptively simple and altogether delicious, pairing perfectly with the recipes listed above. The secret to the perfect French bread? Head over to Jens Reviews for the recipe. Comments RSS You can leave a response, or trackback from your own site. Los Angeles lifestyle, homes, Hollywood history, news, nightlife, architecture, art, food & wine by Jacqueline Tager of Sotheby’s International Realty. For the best houses for sale, places to eat, wine to drink, things to do, and untold histories of Los Angeles's brightest stars and their Hollywood homes.